Fishing at Barmouth/Abermaw01341 280787workFishingBarmouth & the Mawddach Valley have their own attraction for the fisherman. Sea fishing trips depart from Barmouth harbour daily, tides and weather permitting. Local boats cater for parties and details can be obtained from Barmouth TIC. The dry land fisherman can try his expertise from the beach or within the harbour limits. The Dolgellau Angling Association has some of the best freshwater Salmon and Sea Trout fishing in Wales on 13 miles of the Rivers Mawddach and Wnion with the hotspots being the Reed Pool, High Bank and Junction Pool. The Association also owns the fishing rights on Llyn Cynwch situated by Precipice Walk near Llanfachreth. It is stocked every 2 - 3 weeks throughout the season with brown and Rainbow Trout from the Hatchery at Machynlleth. The largest Rainbow Trout caught was a monster 13.5 lbs. 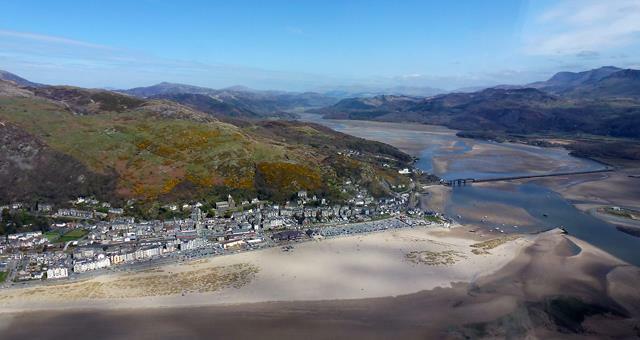 Barmouth & the Mawddach Valley have their own attraction for the fisherman. Sea fishing trips depart from Barmouth harbour daily, tides and weather permitting. Local boats cater for parties and details can be obtained from Barmouth TIC. The dry land fisherman can try his expertise from the beach or within the harbour limits. The Dolgellau Angling Association has some of the best freshwater Salmon and Sea Trout fishing in Wales on 13 miles of the Rivers Mawddach and Wnion with the hotspots being the Reed Pool, High Bank and Junction Pool. The Association also owns the fishing rights on Llyn Cynwch situated by Precipice Walk near Llanfachreth. It is stocked every 2 - 3 weeks throughout the season with brown and Rainbow Trout from the Hatchery at Machynlleth. The largest Rainbow Trout caught was a monster 13.5 lbs.